The Tompkins House must have been an instant landmark when it was built soon after the Civil War. Here Benjamin Tompkins (1808–92), noted advocate for social reforms, made his home. Tompkins served as president of the Connecticut Temperance Society and campaigned for humane treatment of the mentally ill. Owner of the Bozrahville Manufacturing Company in nearby Bozrah, Tompkins was a personal friend of Gov. William Buckingham. 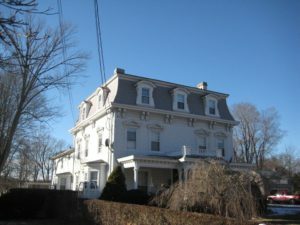 The flirtatious curve of his house’s four-sided mansard roof, with its steep lower slope, was meant to suggest a look of European sophistication. The name for this style of building refers to France’s Second Empire period (1852–70) when the mansard roof became widespread in Paris under a building program by Napoleon III.